Welcome to my Armchair Travelling mini-challenge as part of this weekend's Dewey's Readathon. My love of being taken to different places through reading started as a very young child, when my favourite Enid Blyton books were The Adventures of the Wishing Chair and The Magic Faraway Tree. In the Faraway Tree, the children climb to the top meeting a variety of characters who live in the tree, and when they get to the very top there is often a different land to explore. That sense of adventure through reading inspired my blog name and description, and now the look of my blog. As an adult, I love to read books that make me want to visit new places. These days I can't afford to travel much, so when I read a book like that, I am limited to cyber travelling which involves searching the net for images of locations mentioned in the book, and seeing the major sites of those cities or countries. For example, when I read The Bronze Horseman by Paullina Simons, I can't tell you how long I spent looking at images from St Petersburg. 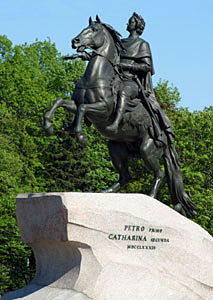 From the statue of The Bronze Horseman, to the Field of Mars,from The Hermitage to St Isaacs Cathedral, from The Summer Palace to many, many more sites. Over the years I have spent time armchair travelling to places like Scotland, Charleston, New York, Tuscany and so many more. My challenge to you (if you choose to accept it) is to write a post sharing some of the sites from your books, or some facts about the place where your books are set. It could be books that you are reading for readathon, or books you have read recently, or some of your favourite books ever. In conjunction with this mini challenge I am offering up a prize to the participants. The winner will receive a book of their choice from The Book Depository and some travel themed bookmarks. I will also send some bookmarks to a couple of runners up as well. The bookmarks may (or may not) look similar to the examples below (only because I am still making them!). To enter this mini-challenge, leave the link to your post in Mr Linky below. The winner will be chosen using random.org. As long as Book Depository ships to you, then you are eligible to win the main prize, and I am happy to send bookmarks to anywhere. I will need to think on this one! Awww, your pictures brought back memories. I lived for awhile in the former USSR and visited those sites shown above, only the city was Leningrad back then. Ah, what a beautiful country. 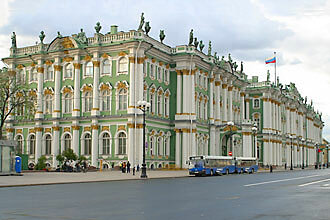 The Hermitage is stunning and back then, when everything was rationed to eat on the bottom level was pure bliss. I met my future husband in Leningrad. We have been together 20 years. Thank you for bringing back happy memories. I love visiting Tortall, Tamora Pierce's world. I have been visiting since I was 9 years old and I am now 25. I am sure to be part citizen now. Oh fun! I've never visited mine, but I really want to... maybe... one day. No question: I love Bill Bryson's books, and he inspired three dreams -- probably none of which I will ever fulfill. A Sunburned Country may just be the best book about Australia I have ever read. I particularly like the bit about dangerous creatures. A Walk in the Woods made me wish I had the knees and the stamina for the Appalachian Trail (although without Katz). The Lost Continent: Travels in Small-Town America is actually referenced in the Wikipedia entry on Pella, IA. I recently applied for a job there, and it's close enough to be within reach if I'm ever in Iowa! 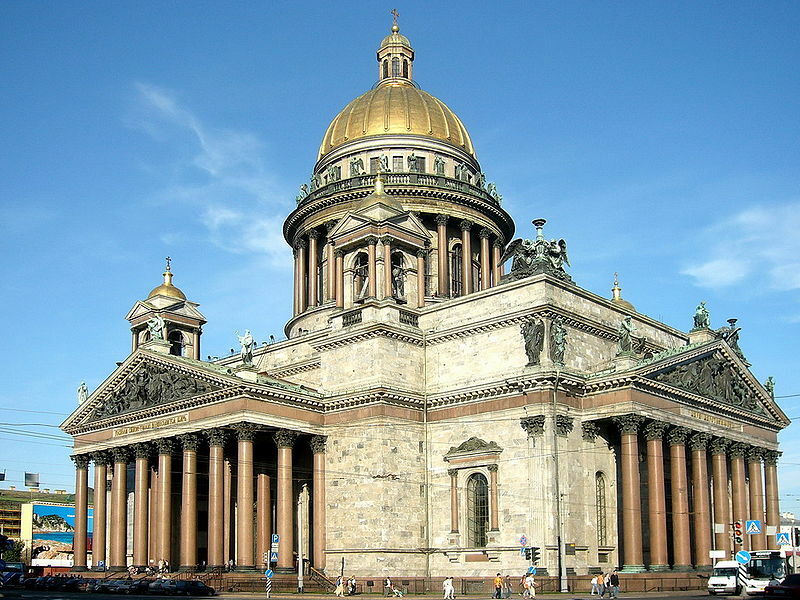 St Petersburg is magical, so many beautiful churches, the Hermitage. Everyone should go there if they get the chance. My entry is about cold countries. My mini-challenge answer is here! Thanks for hosting! I am enjoying the Canadian Reading Challenge and reading novels set in Canadian provinces. Does this mini-challenge apply to fictional locations as well? Or solely non-fiction locations? It's hard to pick one because I love to read and I love to travel. I hope this counts, I don't have a blog. I try to read books about and set in the location when I plan a trip. When we went to Scotland, I insisted on going to Culloden, because of Diana Gabaldon's Outlander series. Great challenge, I love traveling in books. The two books you mentioned look great and I plan to add them to my reading list. 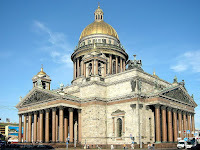 I have been to Russia and the Hermitage museum is awesome! What jolly fun! Great mini challenge idea! Great challenge Marg! I picked two books I'm currently reading but not for the challenge - Dracula and Camus, A Romance, which have taken me to some new and interesting places. Great challenge!! Thanks for the fun! Fairywhispers, sounds like an amazing place. Booksnob, I am jealous! Russia is on my one day list! Deborah, Diana Gabaldon's book definitely helped inspire a desire to visit Scotland for me too! That Girl in the Rose - fictional, non-fiction, anything counts. Michael, I really need to read Bill Bryson's books about Australia and see what he has to say about my home country. Thank you to everyone for participating and taking time to comment.